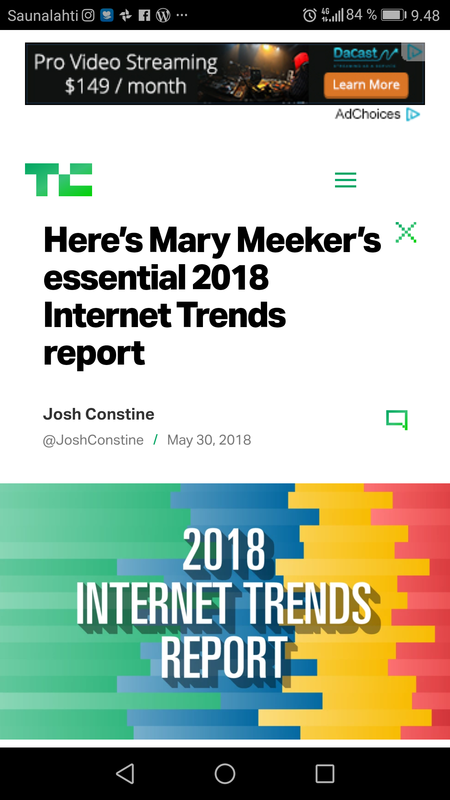 Legendary venture capitalist Mary Meeker has just released the 2018 version of her famous Internet Trends report (294 pages) and Techcrunch has published some highlights. Internet adoption: As of 2018, half the world population, or about 3.6 billion people, will be on the internet. Tech investment: We’re at an all-time high for public and private investment in technology, while the top six public R&D + capex spenders are all technology companies. Half of the world population, or 3.6 billion people, are now on the internet, thanks to falling prices for Android smartphones and a doubling of the total Wi-Fi networks since 2015. But the internet’s user growth rate is slowing, as we still need cheaper data plans and more education about why people need the web. As the internet approaches saturation, apps will see tougher growth because there are fewer fresh users to sign up. U.S. adults now spend 5.9 hours per day on digital media, up from 5.6 in 2016. In what I think is Meeker’s most interesting slide, she shows that 38 percent of Chinese citizens are willing to provide sensitive private information in exchange for product improvements, compared to just 25 percent of Americans. Users are taking the easy route of deleting apps that offend their privacy rather than clearing their browser cookies or digging into privacy policies.